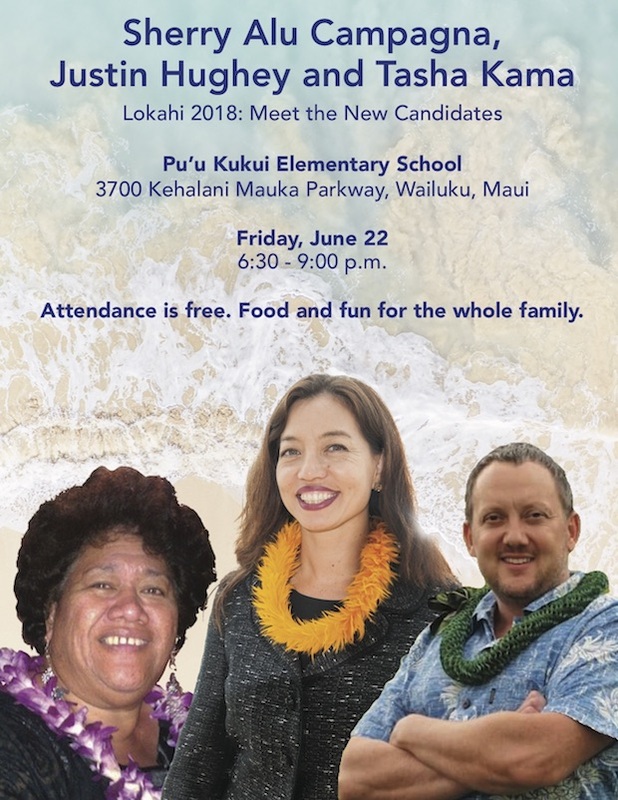 A Talk Story with 2nd Congressional District Candidate Sherry Alu Campagna will be hosted by District 8 (Kahakuloa, Waihee, Waiehu, Puuohala, Wailuku and Waikapu) candidate Justin Hughey and Natalie (Tasha) Kama, candidate for Maui County Council Kahului seat on Friday, June 22, 2018 from 6:30-9:00 pm at Pu’u Kukui Elementary School in Wailuku, located at: 3700 Kehalani Mauka Pkwy, Wailuku, HI 96793. This fundraiser is free to attend. The three candidates cover Maui’s three levels of government. The candidates have planned a fun-filled event to include the Maui County Council candidates who have been invited to participate and will bring their favorite potluck dish to share. Slack key guitarist Terri Garrison will be the featured entertainment. Campagna is an environmental scientist and social justice advocate in her first Congressional campaign. She has been endorsed by the Hawaii State Teachers Association and National Education Association. Hughey is a King Kamehameha III Elementary School special education teacher and HSTA vice president running for the seat vacated by former Speaker of the House Joe Souki. Kama is a social justice organizer who is passionate about her work in community organizing around issues that people care about. She has been endorsed by the Sierra Club and Maui Pono Network. This entry was posted in Maui Democrats on June 16, 2018 by admin7.